Since the launch of Hypothyroid Mom I’ve been contacted by readers about their children suffering from ADD and ADHD. 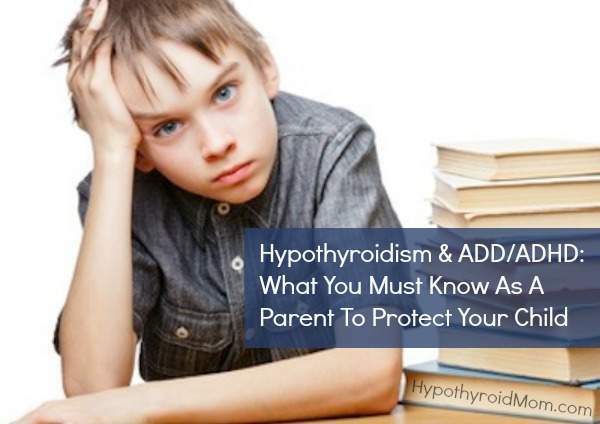 Therefore I was particularly intrigued when I read a post by Dr. Kirk Gair about the connection between hypothyroidism and ADD/ADHD in adults and children. I invited Dr. Gair here to share this often overlooked connection between ADD/ADHD and hypothyroidism. It seems like it’s an epidemic these days, and can be so frustrating for parents to deal with. You know that your child is a good kid and is smart, yet they just can’t seem to focus, can’t sit still, and don’t perform like you know they could in school. Despite all the best parenting, tutoring, and despite visits to doctors, it can seem like there are few options other than strong meds with their side effects. Is there another option? And how do we prevent this from happening in the first place? This one hits close to home for me. If I were a student today, I’m pretty sure I would be on Ritalin or some other medication. I remember trying my best to focus, to behave, to remember to bring my homework or my permission slip for a field trip, and even praying to God every morning that I could stay focused and out of trouble…usually to no avail. Does any of this sound familiar to you? Perhaps you went through it yourself, or are going through it with your kids. Why are we seeing this happen so much today? Learning disorders are estimated to affect as many as 1 in 8 kids today, with boys being more likely than girls. ADD/ADHD seem to be an epidemic, with more kids being put on meds like Ritalin every day. But many of them may be misdiagnosed and given these meds unnecessarily, and far too many doctors write a knee jerk prescription without a proper exam, medical history workup, or bloodwork. After struggling with this issue as a kid, and then for a large part of my adult life, I am finally free of this awful condition. Here is what you need to know and do to find the root cause for you or your child, and also how you can PREVENT it if you are planning on having kids. Not only are there studies linking maternal auto immunity to ADHD, but there are also studies linking it to Autism as well. The mother can have antibodies against brain tissue that can actually target the child’s brain in utero (Ann Neurol. 2013 Aug 13. doi: 10.1002/ana.23976, and J Autism Dev Disord. 2013 Sep 11). This explains another mechanism for the increased rates we are seeing with autism as well. This is pretty significant, and underlies the importance of testing your antibodies. If you have positive antibodies, you need to find out what foods and mechanisms are triggering them. The most common foods will be gluten and casein, but I recommend getting tested to verify. Continued ingestion of foods that trigger antibody production can cause those antibodies to target fetal tissue as well. With the information from these current research studies, do you think that it is still wise to simply ignore your antibody levels? Sadly, this is exactly what too many doctors are still doing. This study suggested that if the TSH was just in the upper 25% of the NORMAL range, that there was a correlation with learning disorders and ADHD. These findings were also supported in another research study in J Child Psychol Psychiatry 1996 Jul;37(5):579-85, which found that higher levels of thyroid hormones correlated with increased distractability. As with the maternal study, these risks were increased with just subclinical hypothyroid, and even with normal thyroid and just antibodies. First off, you need to get proper testing prior to pregnancy and get your thyroid as optimal as possible. This means insisting on getting not just TSH and T4 tested, but also T3 free and total, T3 uptake, and thyroid antibodies. If antibodies are present, I would get tested for intestinal permeability and gluten reactions. Avoid doing just the alpha gliadin and transglutaminase test, as it can yield a lot of false negatives. I would run the Cyrex Labs array 2 to test for intestinal permeability, which is extremely common with auto immunity. I would also run the Array 3 which tests for 24 reactions to more gluten proteins than the 2 most common. Also, some doctors will only look for Celiac disease. It is important to assess even if you just have gluten sensitivity without actual Celiac’s, as it can still cause a lot of destruction. I would eliminate all gluten at minimum, and consider eliminating casein, corn, and soy. You may want to consider following an auto immune paleo type of diet as well. Of course, I recommend that you seek the help of a qualified practitioner to help you with this. This physician must be knowledgeable about auto immune conditions, how to test for them, and how to create nutritional protocols for them. You also need to look at the blood work for any glucose dysfunctions, anemias, hormonal imbalances, inflammation, chronic infections, etc. If you see ADD/ADHD symptoms in your child, I would run these tests on them as well. I would also go gluten free and even grain free as well. I highly recommend that you also read the book Grain Brain by neurologist Dr. David Perlmutter for more details on how gluten and grains affect brain function. I would also seek the help of a doctor trained in functional medicine and functional neurology. He or she can assess any neurological imbalances as well, and prescribe specific neurological rehabilitation exercises to help with brain integration. Dr. Kirk Gair was trained in functional medicine by Dr. Datis Kharrazian, author of the popular book Why Do I Still Have Thyroid Symptoms? When My Lab Tests Are Normal, who was his classmate and friend since chiropractic school. Prior to becoming a doctor, he was a middle school and high school teacher, had suffered with A.D.D. and undiagnosed Hashimoto’s since childhood, and finally overcame them with the techniques he learned from Dr. Kharrazian. Dr. Gair has been in private practice in So. California since 1999, where in addition to functional medicine and chiropractic he also specializes in advanced cold laser therapies for injuries, and treats many college and professional athletes. READ NEXT: Are you living life with thyroid brain fog? I realize that most likely I’m ADHD having other symptoms throughout my childhood it all makes sence and having all hypothyroid women constantly not understanding why I feel the way I do and insist that it’s my problem. I guess that since they have been on meds for hypothyroid it has helped what I see as Their ADHD symptoms so they dont feel as poorly as I. And what’s worse is my parents won’t help me as they watch me struggle to keep my head nearly above water I’m now homeless with a job sleeping in my car so I can keep my 18 yr old cat in boarding until I can find a place. They originally said they would help me out when they sold some property but didnt. Now they reply to my form of communication “text the only way I can communicate without interuptions” as a personal assault and that all I ever do is ask them for money I dont get it…I recently asked to borrow. I never ask for money in fact I had a hard time even asking for help and yet rejected again. I’m circling the drain and their watching me and pretty much waving. I cant afford a diagnosis to get meds to treat what I think I have. And I have tried to inform them of this information that I found only to be ignored yet again…typical of my childhood.